My answer is: 49 Western to be extended to 95th/The Plaza but end at 79th after The Plaza closes. I feel like since 49A South Western was discontinued last year it has been very inconvenient traveling the The Plaza. The 349 is optional but some people don't like paying extra fare if they have a 1 or $28 7-day pass. Why not have some flexibility? 48 South Damen only runs during AM/PM rush hours to The Plaza in which that's not convenient enough for traveling. It should just originate back to 87th. From what I hear there is not much to the Plaza these days[Carson's is the only store left?]. That might be the only problem with a #49 extension. I thought of the #41 when I was posting. I had a great feeling that 41 Elston/Clybourn would be mentioned as a popular route to bring back. @geneking7320 Yeah I understand about the decline of stores at The Plaza. Good point. @Bus fanatic30 Yes indeed they shouldn't did a lot of service cuts throughout the years. ...Yes indeed they shouldn't did a lot of service cuts throughout the years. Were you going to provide the $100s of millions CTA was short in 2010? Were you going to provide the 100s of millions CTA was short in 2010? Geez can you be anymore of a negative cynic today? Anyway getting to the topic at hand, if it were possible to bring a route back, the 41 would be a good one for the reason mentioned above. For similar reasons, I'd also restore the 11 to North/Clark at the very least. The downtown portion was kind of weak but it did have decent ridership along that middle portion because of all the shops and restaurants up and down Lincoln Avenue. If I had the opportunity then yes but I don't work for them. They brought that upon themselves but we're paying the ultimate price. Look what just happened to Lincoln Avenue segment between Western Brown Line to Fullerton Station deplorably getting cut thanks to lack of commitment, leadership, and communication towards riders and business owners. It's a damn shame man. What's with the negative approach from you inadvertently? Sales tax receipts and especially real estate transfer tax receipts went into the toilet during the midst of the recession. CTA couldn't pay its drivers in scrip, so had to lay off 10% of them, since the other 90% wouldn't accept furloughs, when the union took a vote on that. Unless you are playing in a fantasy league (and Aaron Rodgers was not available last night, except on State Farm commercials), this is a meaningless exercise, unless somehow you have a source of funds to provide service at the level it was, say, before the 1997 Boos-Allen cuts. Update: The question isn't whether you worked for them, but whether you were going to pay enough taxes to make up the shortfall. Like I said, unlike Mark Zuckerberg, I don't think you had the $100 million. It's a hypothetical scenario so lighten up for once. Why even put a response if you find the exercise so useless? Somebody asked me "What's with the negative approach from you inadvertently?" I'm not sure what that meant, but the inference I got was that someone wanted the response, which he got. And there was nothing inadvertent about it. Now, if somebody wants to ask the administrator to change the topic to "Fantasy" bringing back a route or segment, fine. But, other than that, everyone has to realize that there are economic constraints to any such discussion, if it is serious. I think we all understand that if the CTA was in much better financial shape, perhaps we would still have some of the routes that we liked or performed okay. Most of those routes that were cut were either because the routes comparatively speaking were low performers or there was nearby duplicity that was not necessary. Some routes didn't fall into those catagories but still saw the ax (X routes) for whatever reasons. The X routes were created to provide better service and proved very popular. The CTA wasn't in great financial shape when they were created, but create they did. Therefore it is not within a somewhat reasonable scenario that a former route or two could be brought back, either with some outside funding or CTA's willingness to try something new. Hence in this setting, this topic is a good one. 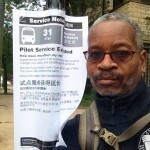 It doesn't mean CTA has the funding to bring back routes, but it is a good discussion. While this thread is concentrating on bus routes, IF FUNDING WERE AVAILABLE, I would like to somewhat resurrect an old rail line, the Humboldt Park Service. Currently the Bloomingdale Trail is being constructed along the route I would propose, but it could bring relief to passengers at Western, Damen, and Ashland staions along the O'Hare branch of the Blue Line. After crossing the UP tracks, this route could join the Pink and Green Lines and run into the Loop, perhaps even being part of the Pink Line. Trips beginning at St Louis would be marked 54/Cermak and trips beginning at 54/Cermak would be marked Humboldt Park with all trains running clockwise through the Loop. I understand that due to building constraints along the route currently, this would drive up the cost considerably, but the same could be said of the proposed Circle Line which would 've used the Paulina Connector and ran along the same routing north of Lake St to at least Division. I would have to say bringing back the X routes makes the most sense. I don't understand why they can't cut some of the local service before like they did on the #80, #55 and #9. I would do that on all x route local service. That was a good plan. How many years are we going to have to wait for a BRT equivalent to this? Ashland BRT is only one street. What would really make alot of sense is bring back the X routes on the local streets and due something similar to what Pace is doing for the BRT's. I would make LSD BRT with stations built into the roadway or at least between the exit ramps and roadway with stairs to the street. They could then eliminate all the express buses on LSD and make shuttles out of the non expwy portions of the route. Maybe in the future when funding is available turn that into a PCC/light rail line. That would be really nice for the lakefront. If nothing else, the X routes would be the easiest to reinstate. If "decrowding" were a true purpose, then I think that would be feasible. It certainly is less expensive than "BRT" and serves the same purpose. If only the Ashland, WEstern, and Cicero Xs came back, that would be enough for me. It would be even better now that the CTA has more artics as those routes could be ran with them (77th could operate the X9, NP could operate the X49 along with 77th, and K could operate the X54). Your Lake Shore BRT is an interesting concept. In Minneapolis, there are some Metro expresses that operate along I-35W that stop at Lake ST (which there is a cut out for a bus stop on the shoulder of the expressway). This bus stop is on the elevated portion of the expressway and there are stairs that descend down to Lake St. The bus drops off inbound to downtown and picks up outbound from downtown, but I think it is more for the convenience of the suburban passengers than for the inner city and am not so sure that would work along N. Lake Shore DR..
Well, for as heavily traveled as the 4 Cottage Grove route seems to be, it would be nice if that line was restored to full owl service back to 95th & St. Lawrence as opposed to terminating at 63rd Street from 1 am to 4 am. At the very least, extend owl service for the 4 to 79th Street seeing as the 79 is a 24/7 east-west route that connects with the 24/7 Red Line. I mean, that seems like too large of a section of the south side (i.e, Chatham, Grand Crossing, a part of Woodlawn) to be cut off from access to major north-south 24/7 bus service, especially when you consider that 3 the King Drive totally stops running around 12-12:10 am. Question there is the passenger count vs. they can take the Red Line and a cross street. Yes, where they want to put BRT, like on Ashland, there is no space for it. Can you imagine a one lane Ashland with speed cameras restricting traffic to 20 mph in spots and red light cameras making drivers pause at intersections? The Pace expressway plan is really intelligent, because there is space that can be played with. Similar to the Pace plan, what I propose will eliminate alot of extra service and traffic off the drive. If you add all the riders up for LSD alone that warrants a special service. I'm surprised no one has mentioned such an idea by now. Just think a service that connects MSI, the Museum Campus, Navy Pier, Milliniuem Park, Michigan Avenue, Several Beaches, Lincoln Park Zoo, and the heavy concentration of condominiums. along LSD. Really it does make alot of sense. Most everyone knows what route I want to see reinstated fully... so much so that I won't even mention the number or name. Members like Busjack and jajuan probably know since I mentioned it so much. Art Does bring up value points. stations that one set of Board Members decide to take down .A new set of Board Members bring then is spending the money to bring then back. Plus,the amount of debt they have makes it nearly impossible to add service. I will give a clue.It was on the Northwest side. Damn, those really came in handy especially X54 going to Midway from Congress Blue Line vice versa under 30 minutes. Hey that's why you a member for to share your thoughts and ideas no matter how many people already knows. It's ok.